Van der Veer Games. Bird On A Wire. Birds of a Feather! Flock 'em together before your wires snap! 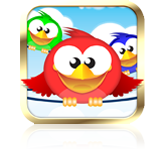 FEATURES: Realistic physics action with super cute birds and super easy game controls! Help birds of a feather flock together to score some outrageously high GameCenter scores, just don't be too greedy or your wires may snap! Welcome to Bird On A Wire, the physics game that's families across the globe are flocking to! GAME CONTROLS TAP the birds to make them fly down to a lower wire. PAUSE the game at any time to post a magic moment photocard to facebook. GAME PLAY We've keep gameplay as simple as possible so that Bird On A Wire truly is a pick-up and play game. All you need to do is reach your stage goal and then it's on to the next stage. Each new stage unlocks new birds or new special characters making it harder and harder to keep those wires from snapping! Good news is, any wires that snapped are reset at every new stage in the game!